Great wines are sometimes a lot like real estate: it's all about location. Our selection is one of those wines. It's from the Bordeaux appellation of Graves, which also houses some of the greatest ch?teaux known. Graves is so named because of the main component in the soil: gravel. No other crop could grow here except grapes. There's just not enough soil for the roots to get a foothold, which is exactly what you don't want the roots of your wine grapes to do. The reason for this is that the longer and stronger the root system is, the healthier the vine system is. Healthy vines produce healthier grapes, so everybody is happy. The soil here forces the roots to dig deeper and deeper to find water. In so doing, they pick up vitamins and minerals, which they send back up to the vines. And that's what causes healthier, more complex grapes, from which you can make great, complex wines. 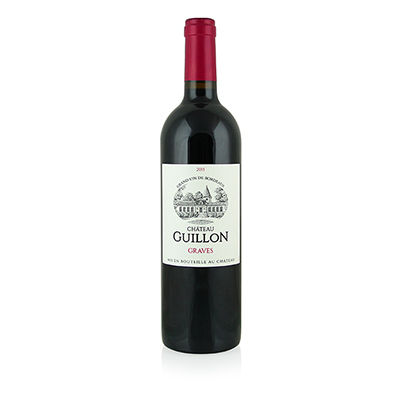 Ch?teau Guillon has rested in this glorious place for over 300 years. In that time, it has produced some of the finest wines Graves has to offer and their winemaker, Marc Maintenat, is making sure that it stays that way. This wine is 75% Merlot and 25% Cabernet Sauvignon. That is pretty much the usual blend here. Merlot in Bordeaux, though, is very different than Merlot in California. Here, it is big and bold, offering extracted and exciting flavors of blackberries, mint, cocoa and beyond.